This plant is on the Prohibited Invasive Species list in Alberta. Hydrocharis morsus-ranae spreads rapidly by way of long, cord-like stolons, easily giving rise to a floating mat of interconnected plants. It is capable of over-wintering by forming vegetative buds, called turions, located at the base of the plant. 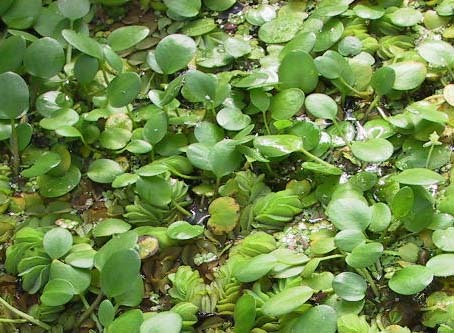 Hydrocharis morsus-ranae has rapid vegetative spread and the ability to form dense mats, which can limit light penetration and fill the water column in shallow areas. In doing so it can strongly affect native aquatic life. It can also inhibit boat traffic and limit recreational activities.